Having solid connections throughout your brake system is important for obvious reasons. Brake lines transfer fluid under a lot of pressure, sometimes 1200-1400psi, and leaking connections will decrease the brake line pressure and allow air into the system, which causes a spongy or low brake pedal. So to begin, we’ll show you some tips on how to plumb your brake system, get familiar with the various types of automotive flares, and look at some of the tools needed to get the job done. For those designing the brake system from scratch, there are a few things to consider before getting started: the size and material of the lines, and the fitting style you will use to connect them. To keep your build simple, it’s recommended to use the same size brake lines for both the front and rear brakes. We suggest 3/16-inch line for most applications, although some rodders use 1/4-inch line. To ensure your brake system remains leak-proof, it’s best to choose one type of fitting and use it throughout with the least number of splices and fittings possible. When you start designing the layout and determining where to route your lines, most of your bends will come off the master cylinder and around the front and rear axle. To make this step easy, first take a piece of bailing wire and bend it to the length and shape you need and then use it as a template to form the brake lines. Doing this step first will save you the time and headache of tedious trial and error work. In the automotive industry there are four main types of tubing flares: 45-degree double flare, 45-degree single flare, 37-degree single flare, and the bubble flare. The most common type of flare you’ll find on domestic and street rod applications is a 45-degree double flare. The double flare is used on high pressure circuits like the brake and clutch system. The tubing is folded over on itself, creating a thicker lip that makes a stronger seat surface for the flare nut to tighten against. A 45-degree single flare has the same 45-degree taper without the folded lip portion and it’s usually used for systems that require less fluid pressure like carbureted fuel lines. 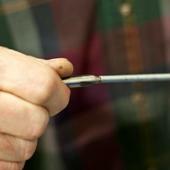 Getting a good cut on your brake tubing is the first step in making a smooth and even flare. 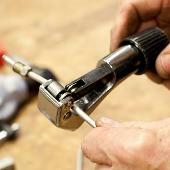 Hack saws or cut off wheels leave burs or uneven edges, which is impossible to mold into a flare that will seal. For the hobbyist or anyone working on the brake system frequently, the deluxe lever action flaring tool is by far the most efficient tool on the market. It has a rotating head that will form a 45-degree double flare or single flare, and bubble flares on stainless or mild steel tubing. 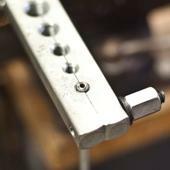 Simply mount the head in a vise, pick out the corresponding die, set the rotating head to the needed position and pull the lever. It will flare 3/16 to 3/8-inch tubing perfect and fast every time. The first step to achieve a good flare is making an even cut. Put a dab of oil on your cutting blade, this is a good way to ensure long life with your cutting tool. In this photo, you will notice after making our cut, the tubing has compressed in on itself (closing the hole) unevenly which will not allow for an even flare. Before you flare the line, make sure you clean up the edges with a file. 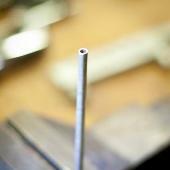 You can take a cone file and carefully smooth-out any burs or uneven metal on the inside bore of the brake tubing. Skipping this step can split or crack the line when you attempt to make your flare. Here is the final piece after filing both the inside and outside edges of the line. The most important part to a good flare is having a smooth and even surface to compress. 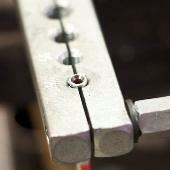 Insert the tubing into the flaring tool and use the bottom lip of the die as a guide as shown. 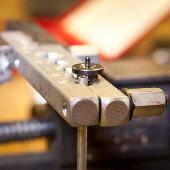 The tubing should come up far enough to touch the bottom lip of the die about 1/4-inch. 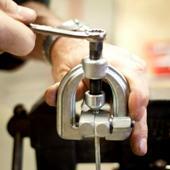 Install the 45-degree double flaring die (included with flaring tool kit) and tighten down with a wrench until the die is flush with the top of the flaring clamp. After the first flare is done, check to make sure the tubing has compressed evenly. Here is how your finished 45-degree double flare should look. Make sure the tapered seat is smooth and free of burs for a tight seal. Good advise on flaring. I think a lot of folks forget the cleaning after the cut part out. 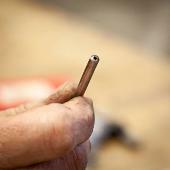 I have always used a quarter inch drill bit to clean with. Use with just enough pressure to clean the hole back to normal size. good stuff- im going to save this page- I know it will help me out for sure! more post like these would be great!